(186 x 246 mm) 8.3 x 11.7 in. (186 x 246 mm) 11 x 14 in. A3 Size 10.7 x 14.2 in. (272 x 361 mm) 11.7 x 16.5 in. MEDIUM 14 x 18.7 in. (358 x 477 mm) 17.75 x 24 in. 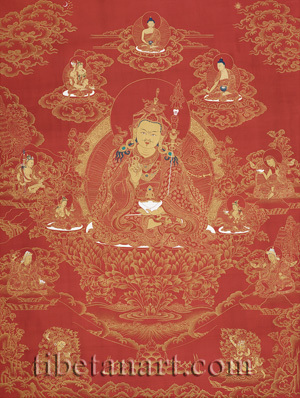 This gold on vermilion thangka was painted by Sunlal Ratna Tamang in 2005, and depicts Guru Rinpoche or Padmakara (Padmasambhava), the 'Lotus-Born', as the central figure of a composition known as 'The Guru's Eight Manifestations' (Tib. Guru Tsen-gye), which belongs to the Nyingma 'revealed treasures' or terma traditions. Padmasambhava or Guru Rinpoche, meaning the 'Precious Guru', sits in vajra-posture upon a thousand-petal lotus, holding a golden vajra in his right hand, and a skull-cup that contains a longevity vase full of immortal nectar in his left hand. He wears his characteristic lotus-hat, which is crowned with a vajra and a vulture's feather, and his trident-topped khatvanga or tantric-staff rests in the crook of his left arm. He wears three layers of coloured robes to represent his mastery over the 'three yanas' or Buddhist vehicles, and the heavy outer cloak of a king. (1)	Shakya Senge (Skt. Shakyasimha), the 'Lion of the Shakyas', was the name he received when he took monastic ordination at Vajrasana (Bodh Gaya). Here he appears as the 'Second Buddha', with a crown protuberance (Skt. ushnisha) and wearing the three monastic robes. He sits in vajra-posture upon a moon disc and lotus, and holds a vajra and an alms-bowl with his right and left hands. (2)	Padmasambhava, the 'Lotus-born', was the name he received when he was invited by King Trisong Detsen to help establish the Tibetan Buddhist monastery at Samye. Here he appears wearing the scholastic hat and robes of a pandit, holding a skull-cup in his right hand and making the abhaya-mudra with his left hand. A circular basket containing books appears behind the brocade cushions of his seat. (3)	Padma Gyalpo (Skt. Padmaraja), the 'Lotus-king', was the name given to him after he arrived in the kingdom of Oddiyana, where he vanquished the drought and famine, was married to Bhasadhara, and invited to rule over the land. Here he appears seated upon his cushion-throne with his right foot resting upon a small lotus pedestal, and wearing the robes, boots, crown and turban of a king. With his raised right hand he sounds a damaru, and with his left hand he holds a golden mirror. (4)	Senge Dradog (Skt. Simhanada), the 'Lion's Roar', was the name given to him after he defeated the heretics in debate at Bodh Gaya, and the wrathful form that he assumed in Nepal in order to subdue the 'eight classes of spirits' and gain control over the three realms. Senge Dradog is extremely fierce with three eyes and a fiery aura, and he tramples two enemies underfoot as he stands upon his golden sun disc and lotus throne. He wears the skins of an elephant, a human and a tiger, a five-skull crown, and a severed-head garland. With his raised right hand he holds a vajra as he makes the threatening tarjani gesture with his left hand, and his consort appears at his left. (5)	Dorje Drolo (Skt. Vajra-lambodara), the 'Pot-bellied vajra', was the wrathful form that he assumed in thirteen 'tiger's den' sites throughout Bhutan and Tibet, where he subjugated the most arrogant and malevolent demons, and oath-bound them to serve as guardians of his termas or 'hidden treasures'. Dorje Drolo is extremely fierce with three bulging eyes, coiled hair-locks, and his face is distorted as he bites down onto his lower lip. Amidst a maelstrom of wind and fire he stands upon a fierce tigress, wearing embroidered silk robes, felt boots, and a garland of severed heads. With his raised right hand he holds a vajra, and with his left hand he holds a ritual dagger or phurba. (6)	Loden Chogsed (Skt. Matiman-vararuci), the 'Supremely Intelligent Genius', was the name he received after he attained full mastery of all the sutras and tantras taught by the various scholars. He sits upon his cushion-throne wearing the robes, boots, crown and turban of a king, with a mirror around his neck and a phurba tucked under his belt. With his raised right hand he sounds a damaru, while with his left hand he holds a nectar-filled skull-cup. (7)	Nyima Odzer (Skt. Suryaprabha), the 'Light-rays of the Sun', was the name given to him when he subjugated and oath-bound the arrogant spirits at the charnel ground of Kuladzogpa in Kashmir, where he also taught the dharma to the dakinis for five years. Here he appears in the form of a mahasiddha wearing a tiger-skin loincloth, a five-skull crown, golden ornaments and a meditation belt. With his right hand he holds the shaft of a trident-topped khatvanga, while from the tip of his left index finger emanate light rays that support the golden disc of the sun. (8)	Urgyen Dorje Chang (Skt. Urgyen Vajradhara), the 'Holder of the vajra from Urgyan', was the name bestowed upon him by Samantabhadra in the heavenly realm of Akanistha, where he mastered the Mahayoga Tantras and attained the realization of the Five Buddha Families. Here he appears in the aspect of blue Vajradhara in union with his white consort, as he sits in vajra-posture upon a white moon disc and a lotus. He is adorned with the five silk garment and eight jeweled ornaments, and holds a vajra and bell in his right and left hands. With her left hand his consort holds aloft a blood-filled skull-cup as she embraces her lord's neck with her right arm.